This is my entry for this week's Midnight Madness Sketch Challenge (find it here!!) which I found after Jeni from the design team left a comment on one of my cards. It looks fun, so thanks Jeni!! I made the card for my next door neighbour's little girl who has just turned one. I used my favourite Daisy stamp from Sugar Nellie. I stamped it with Stazon and coloured it with my Promarkers. The image has gone a bit blurry - think I need to get some different ink to stamp with when using the Promarkers!! I used some flowery glittery cardstock that I've had for ages- it just seemed right with this card! The matting to the image was cut using nestabilites Blossom dies. I embossed with Swiss Dots embossing folder. I also embossed my large lilac flower with Divine Swirls. The number 1 is chipboard. I covered the original pattern with a blue permanent pen, then embossed with blue ink and holographic powder. Hi everyone!! Hope you all had a good weekend. It's been gorgeous here and long may it last!!! On Friday I went to meet Jenny who has the blog Stamps, Pencils and Paper! Check out her blog - here!! Jenny makes some gorgeous cards and gave me some great tips on colouring in with my new Promarkers - thanks Jenny!! I have since had a go colouring in the new Upside Down image from Sugar Nellie and was quite pleased with the result so thought I'd have go entering the Passion for Promarkers challenge!! The challenge was to use Promarker colours Lemon and Meadow Green. I've also combined this card with the current Truly Scrumptious challenge. This was a sketch challenge. There was also an additional challenge to use some neglected stash so I used some flowery yellow Papermania Colossal papers that I haven't used in ages. The green papers are Papermania Olvine Essences. I used these and some black card to make the nested flowers from Cuttlebug dies. The wooden number 4 is also from my neglected stash!! I coloured it with a VersaMagic chalk ink pad in TeaLeaves and then covered it with Stickles glitter glue in Star Dust. Hello everyone! Hope you've all had as gorgeous a day as we have in sunny Scotland!! It's been absolutely lovely here today - the kids even had the paddling pool out this afternoon!! The backing papers are all from the CCSR Big One paper pack. I coloured over all white areas with yellow and turquoise whispers brush markers. The car stamp is from Papermania - stamped with black ink and clear embossed. Today I have another Father's Day card for you!! This is the one I made for my children to give their Dad - couldn't put it on here before or make it with any challenges in mind on the off chance that he might read my blog!! The image is 'Marshmallow does DIY' from one of the Daisy & Dandelion stamp sets. I stamped with black Stazon and coloured with coloured pencils. The screws were also from the stamp set. I stamped them, punched them out with an x-cut circle punch and then covered them in Anita's clear glaze to add a bit of texture. The paper are all from the Clare Curd Signature Range paper pack. I then added a layer of beige vellum over the top of the spotty paper to change the colour a bit and fastened this with brads. The chipboard letters are from the Woodware Chippies range. I inked them with brown fluid chalk and then sanded the edges to distress them a bit. Hope you are all having a nice relaxing weekend. I popped in to Papercrafts in Elgin today (in between dancing classes, trips to the beach etc etc!!) 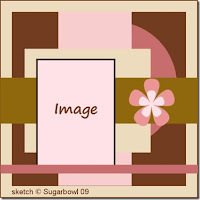 hoping to get one of the new Diane Duda stamps after seeing them on the Sugar Nellie blog hop yesterday. When I got there they were still cutting up the rubber and packaging them up, so I wasn't able to buy one. Must pop back next week as they are very cute!! This card is the one I made for my Dad for Father's Day. I knew I had seen mini-book cards like this so Googled it and ended up getting the template from www.craftytemplates.co.uk. After cutting out the basic template and covering the pages with patterned paper (from Papermania's For Him pack), I punched holes with my crop-a-dile, set eyelets and fastened the mini-book together with ribbon. I cut out the letter shapes again in card, and inked them all over in fluid chalk to add a bit of interest (VersaMagic Aegean Blue and Cloud White, ColorBox Burnt Sienna). The metal square embellishments were from Papermania ages ago. Ribbon and buttons from my stash. We're off on a trip to the Highland Wildlife Park tomorrow so I'm hoping for good weather!!! No card making today as still turning out (and wishing I wasn't). Mind you, I did spend a long time this afternoon blog hopping looking at all the lovely cards created for the Sugar Nellie DudaDaze blog hop. If you haven't looked yet there are some lovely new stamps just out - check it out here!! I just thought I'd let you know about a funny blog a friend told me about. It's called Slightly South of Sanity and written by someone about her life with her two young boys. It's nothing to do with card making but if you have small children you'll appreciate some of the embarrassing situations she seems to get in!! My ProMarkers arrived today!! Haven't had much time to play with them yet as had mad evening being sand-blasted on the beach with my daughter's Rainbows group!! I've done this card for the Stampin' Chic sketch challenge. Papers from Clare Curd Signature Range. Also the sentiment which was cut from one of the papers. Forever Friends bear coloured with the promarkers - need lots of practice obviously!! Circle embossed with Swiss Dots embossing folder. By the way, does anyone know how to get the ink flowing in ProMarkers? One of them has a dry white fine tip, the ink hasn't started flowing down to it yet. Not sure whether this is faulty or I can fix it!! Must go and make some tea now - very hungry!! Well, I've finally got round to ordering some ProMarkers!! Been drooling over them for a while and seen the beautiful colouring that so many of you are doing, so I've ordered a few to have a go. I've been looking at the tutorials on Passion for ProMarkers blog and can't wait for them to arrive so I can have a go!!! In the meantime I haven't got any cards done today!! I'm trying to have a complete turn-out and am working my way around the house one room at a time. Consequently I'm in total chaos, but it does feel quite satisfying in a strange sort of way! Mind you, I'm leaving the girls room to last - that one will be a bit of a nightmare!!! Hope you are all enjoying the lovely weather we've had today. My eldest daughter has her school sports day tomorrow so I just hope it doesn't rain!! Hope you all had a good weekend. It was a bit mixed here as my husband went away, due back at the end of August (hopefully!!!) so I had two sad girls to contend with!! Back to the normal school/nursery routine today to take their minds off things - unfortunately less than three weeks until the school holidays - aaarrggh!!! The card I have for you today is the one I made for my father-in-law for Father's Day. I have used the Sugar Bowl sketch (which I've rotated) and also the 'please include' for the challenge which was to use green and blue. I used one of my new Sugar Nellies - "In the Garden" - as I think he'll be spending a lot of time there now he's retired!! The blue and green card was embossed with Perfectly Paisley and Divine Swirls embossing folders. The patterned paper, chipboard watering can, brads and ribbon are all Papermania. The scrabble letters came from MadAboutCards. The image was stamped in black Stazon and coloured with Staedler coloured pencils. Edges all inked in VersaMagic fluid chalk in Aegean Blue. Friday at last!! I hope you have some nice things planned for the weekend. My eldest daughter is doing her first display of Highland Dancing at one of the local primary schools summer fete and she is very excited about it. Hopefully it will go okay as she hasn't been doing it very long!! My card today is the one I made for my Father-in-law's 65th Birthday (which is today, so HAPPY BIRTHDAY MICHAEL if you are reading this!!!!). I followed Clare Curd's sketch over on the DoCraft's website. I made the card blank from double sided patterned card to add a bit of interest. It came from the Papermania monochrome collection. The wooden numbers were from The Works I think. I inked them with black ink and then used black embossing powder. When cool I covered in clear pigment ink and embossed with holographic powder to make them nice and shimmery! The buttons were from a black and white embellishment set from Lakeland. I've attached them with silver Desire Wire from my jewellery making stash. The ribbons were also from the embellishment set. The patterned paper is from the CCSR Big One paper pack. Thanks for looking!! Have a good weekend!! This is my entry for the current Sugar Bowl challenge. It is a sketch challenge and also pearls needed to be included on the card, so I have used pearl brads in my flowers. The card is for a good friend of mine who has just had her first baby - four weeks early and only 5lb!! My girls had a great time going baby present shopping!! The image I have used is Daisy with Pram from Sugar Nellie, coloured with Staedtler pencils. I used blue handprint printed paper from Bits 'n' Pieces Baby Papers. The cardstock was embossed with Divine Swirls and Swiss Dots embossing folders. Flowers and brads from stash - mostly Papermania. The sentiment is from a set of baby themed buttons I bought ages ago, can't remember where from!! We're off down to Cornwall again tomorrow to visit my parents. My Dad is back out of hospital now and doing well so it will be great to see him again!! I'll be back with more cards next week. Until then - have a good weekend!! !